La Jolla UTC is not only one of the fastest growing workplace communities in the country – it also has one of the hottest emerging food scenes. Irvine Company boasts the ideal workplace environment and location for all companies, providing employees with a diverse array of dining options in close proximity to La Jolla UTC. The following content is created in consultation with Irvine Company Office Properties. It does not reflect the work or opinions of NBC San Diego's editorial staff. Click here to learn more about La Jolla UTC. For those who are lucky enough to work in the area – this means delicious working lunches (and dinners) are only steps away. Here’s just a hint of what’s on the menu in the increasingly exciting culinary destination. In the heart of La Jolla UTC is the newly expanded Westfield UTC Mall featuring some of the most talked-about restaurants in San Diego, including True Food Kitchen, which offers a healthy, flavor-forward menu with a variety of gluten-free, vegetarian and vegan offerings for brunch, lunch, dinner and cocktails. Also, just arrived is one of New York City’s most popular burger stands, Shake Shack, offering irresistible 100% all-natural Angus beef burgers, as well as their griddled-crisp flat-top dogs, fresh-made frozen custard, crinkle cut fries, craft beer, wine and more. Fine dining awaits at Larsen’s where you’ll find seasonally inspired menus and an ever-changing selection of global wines, all in a sophisticated setting. Perfect for impressing out-of-town clients or celebrating with co-workers. Forget the car, thanks to the walkable system at near-by Irvine Company workplaces, lunch at the mall is only a short walk away. Their complimentary shuttle service takes you to nearby stops like Bistro 24, featuring casual dining, as well as Westfield UTC Mall. 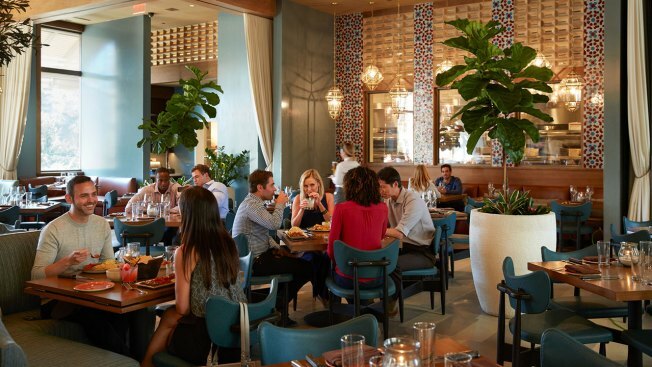 One of the new restaurants in La Jolla UTC is located at The Plaza, where celebrity chef Rick Bayless’ Red O Restaurant “puts a Cali spin on Mexican cuisine,” according to San Diego Magazine. Here you’ll find classic Mexican dishes, along with prime steak and seafood, as well as an award-winning wine list and live entertainment. If you’re looking for something a bit more casual, Bistro 24 and Joes on the Nose in La Jolla Center offers a wide variety of sandwiches, wraps, burgers, salads and specialty coffee drinks. They can also cater meals for those office meetings that last through lunchtime. Fan of global cuisine? You’re in luck. Irvine Company workplace communities in La Jolla UTC also offer a wide variety of food trucks to keep your inner foodie satisfied. More delectable choices await further afield in La Jolla UTC, such as Regents Pizzeria which could give both New York and Chicago pizzerias a run for their money. Regents feature thin crust and deep-dish pizzas, as well as burgers, sandwiches and a lengthy beer list which showcases many local breweries. For those early morning meetings, head on over to Snooze, where you’ll find an eye-opening assortment of benedicts, sandwiches, pancakes, cocktails and much more. Also, just arrived is one of New York City’s most popular burger stands, Shake Shack, offering irresistible 100 percent all-natural Angus beef burgers, as well as their griddled-crisp flat-top dogs, fresh-made frozen custard, crinkle cut fries, craft beer, wine and more. Fine dining awaits at Larsen’s, where you’ll find seasonally inspired menus and an ever-changing selection of global wines, all in a sophisticated setting. Perfect for impressing out-of-town clients or celebrating with co-workers. If you’re looking for something a bit more casual, Bistro 24 at One La Jolla Center offers a wide variety of sandwiches, wraps, burgers, salads and specialty coffee drinks. They can also cater meals for those office meetings that last through lunchtime. More delectable choices await further afield in La Jolla UTC, such as Regents Pizzeria which could give both New York and Chicago pizzerias a run for their money. Regents features thin crust and deep-dish pizzas, as well as burgers, sandwiches and a lengthy beer list which showcases many local breweries.